English: Makemake (minor-planet designation 136472 Makemake) is a dwarf planet and perhaps the largest Kuiper belt object (KBO) in the classical population with a diameter that is about 2/3 the size of Pluto. 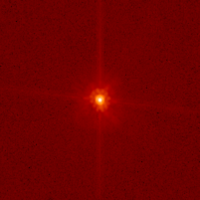 Makemake was discovered on March 31, 2005, by a team led by Michael Brown, and announced on July 29, 2005. Initially, it was known as 2005 FY9 and later given the minor-planet number 136472. Makemake was recognized as a dwarf planet by the International Astronomical Union (IAU) in July 2008. Its name derives from Makemake in the mythology of the Rapa Nui people of Easter Island. Makemake has one satellite. Its extremely low average temperature, about 30 K (−243.2 °C), means its surface is covered with methane, ethane, and possibly nitrogen ices. Media in category "136472 Makemake"
This page was last edited on 6 January 2019, at 07:17.